Photo by Kevin Dunn of Big Powerful Media. On May 24, we took our Work Design TALK series to Houston for the first time. The new Knoll showroom set the stage for a sold out crowd of designers, end users, and commercial real estate professionals. On the panel, we had a mix of workplace experts: a designer, a commercial real estate developer, a startup end user, and an organizational development consultant. Each one represented a unique perspective, but the conversation was really about common goals. By the end of the TALK, the panelists had all agreed that choice and the amount of choice that we now have in the workplace is truly an important component of productive offices. Below, check out our five key takeaways, and if you’re based in D.C. or Chicago, we hope you’ll join us for our next two TALKs this summer! More and more, organizations are designing spaces to meet a variety of different types of work and needs. The desk just doesn’t cut it any more: we need workspace that can handle different functions. The space is becoming more complex and will require conversations with employees about how to use it properly. 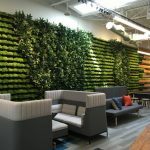 Gaurav Khandelwal, the founder and CEO of ChaiOne, pointed out that you can offer a great space and tons of choices to your employees, but it probably won’t do any good unless they’re allowed to truly have fun and enjoy it. For his part, he installed a silver sofa outside of his office that he uses for informal conversations. A small move like that can have a big payoff when you’re trying attract talent — we spend so much time in the office that the attitude is important. Mike Fransen, the managing director of Parkway Properties, had an interesting perspective on what only a landlord could bring. When it comes to choice, he said, it’s important that the people have similar desires and values. The attorney in the large law firm isn’t going to share the same needs as the young tech geek in the startup. Kathleen Kelley, an organizational development consultant, mentioned that once people experience something that they value and like there is little likelihood that they would go back and accept the old way. She spoke specifically about the 9/80 schedule, which allows employees who work a nine­ hour day, Monday through Thursday, and thus to take every other Friday off. Older leaders sometimes lack trust, imagining that if an employee is not at her desk, she’s not working. In order for the staff to feel comfortable, leadership has to demonstrate the desired behavior. Heather Van Ravenswaay, an associate principal at PDR, shared that an employee in one of their new spaces was avoiding his open work environment. When asked why, he responded that his boss didn’t think that he was working when there. To keep this from happening, must define the expected behavior and set the example for other employees adjusting to new choices in their work environment. A special thank you to our sponsors for making this event possible: AgilQuest, Knoll, ACS Flooring, Tandus Centiva, The OFIS, Workplace Evolutionaries, and Hines – San Felipe Place.